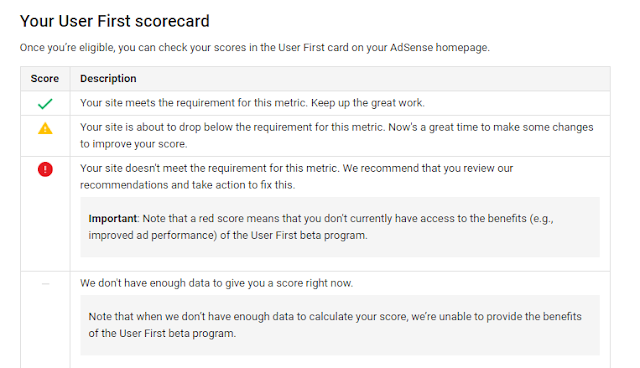 Google Adsense has recently launched User First Program (Beta Program) for the Adsense publishers and webmasters who care their readers and users. "User First Program" is designed with the purpose of serving better Ads and boosting the Ad revenue of publishers. I am also one of those lucky webmasters who has got an invitation from Google Adsense team to give a try to this User first beta program. Today, When I logged into my Google Adsense account I found the Invitation by Adsense team to participate in their user first program. Here is the screenshot of the Invitation. After that, I studied and collected all the facts related to this new Google Adsense user first program. In this post, I will share all those facts and points that you need to know about this program in detail. What is User First Program Google Adsense? This program is all about delivering high quality and better ads to users to boos Ad revenue. With this program when reader/user logged into their Google account, they will be shown fewer but better Ads. Google recognizes you care about your users. We think you're doing a great job so we'd like to help you take help of User first, an exclusive early access beta program. User first is designed to boost your revenue and give your visitors fewer but better Ads. It will definitely create a better user experience. Your readers will love to stay for a long on your web/blogs. Your users will be more engaged with the Ads. The main purpose of this program is boosting the revenue by delivering the high-quality ads. It will help you get high CPC. It will also manage Ad distribution in a better way among the webmasters. Websites with good quality content, fast loading speed, the good user experience will be delivered more ads and spammy websites will get fewer Ads and low revenue. How to Get Invitation/Participate/Start User First Program by Google Adsense? You don't (can't) need to do anything from your side to get enrolled in their First program. In simple, they are just inviting the webmasters who have websites with fast loading speed, high Ad satisfaction score, good user experience, good Ad layouts etc.. If you able manage and maintain these points you may get the invitation. Once you're invited to the user first program you can check your scorecard in "User First Program". Scorecard notifies you the Status of your eligibility. It means your sites meet the requirements and you are eligible for user first Program. It means your site might drop the requirements level and you may no longer eligible to participate in user first program. Now it's the time to check and maintain your site metrics. It means you are no longer eligible to participate in this program. If you are very new or started recently then you may see "we have don't enough data to prepare your scorecard", in that case, you need to wait for few days and you will have your scorecard. Make your website loads faster. Start using responsive Ad units. Don't use any other Ad Network Ads on your site. Lower the number of banners on your site. Remove the codes/Ads from 404 not found, unwanted label, category, fewer content pages. Just a few hours ago, I have started using user first program. I will update my experience in this post after a week. In that update I will reveal how this program works and participating in User first experience is worthy or not. At last, I would say if you have got this notification then must give it a try and share your experience with us and our lovely readers. If you have any doubt or question related to user first program then you can here without any hesitation. I would like to make this discussion a bit longer as it's a very new program by Adsense. Message: I hope that you have enjoyed 'User First Program (Beta) by Google Adsense - A Detailed Guide' article on Tips2secure. However, if you want me to deliver more items, then please share my post. You can use Social Sharing Widget provided at the end of every post. After all, Sharing is Caring! 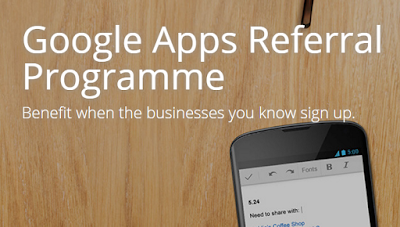 By joining the Google Apps Referral Program, you’ll receive US $7.50 for every user who signs up using your link. This referral program has been started by Google just for their product Google Apps for Work. Google Apps for Work gives businesses the tools to get more done with professional email, online storage, shared calendars, video meetings and more. It is messaging and collaboration applications suite from Google, costs $5/user/month OR $50/user/year to end client ($28/user/year if your company's headquarters based in India and most of your users login from there). Before proceeding on How it works and how you can participate in this referral program, I would like to add the lists of Countries that are eligible for Google Apps for Work referral programme. 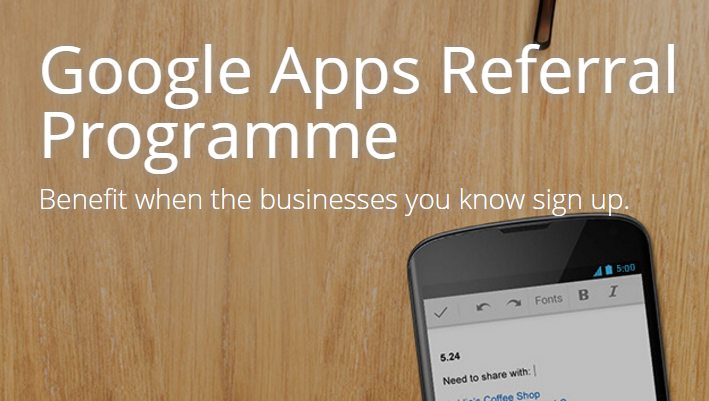 Recently Google Apps referral program has launched in India. Unfortunately, if you are not a residence of above listed countries you can fill this form to get notified through email once this program will be started in your country. Google is continuously expanding this opportunity in different countries. Sign up with your name and email at Google's Referral Program site. You will need your bank account to collect referral payments from Google. You will receive a unique referral link after registering for the program (similar to all online affiliate businesses). Now you can start with email and website templates that Google will provide, in short these email and/or web templates will have your affiliate link. You will get reward when customers sign up using your unique referral link. 1. You will earn $15/user, paid directly to your bank account. 2. You will also get coupons that save your referrals $10/user for the first year (so its a win-win:). 3. Get more coupons once you start showing your google love. How much you can earn with Google Apps Referral Program? As a member of the Google Apps Referral Program, you can earn $15 per user for every new Google Apps for Work customer you refer. You are eligible for payment on your customer’s first 100 users and there is no limit to the number of customers you can refer. Users are eligible for payment only if they are new Google Apps for Work customers and have not previously signed up for a trial. Payments are processed on a monthly basis. What are the Coupons in Google Apps for Work? You will get some coupons to promote this program. If you provide a coupon code to one of your referrals, he/she is entitled to 20% off per user for the first year as a Google Apps for Work customer. Your referrals can enter their coupon code in the Billing section of their Customer Admin Console when they sign up or throughout their 30-day trial period. 1. Sign up for Google Apps. 2. Go to your billing settings. 4. Enter your promo code. Warning: Sharing Coupons in public is against their terms and conditions. If anybody finds doing this will be banned from using this program. 1. Buyers can get customised email and more with Gmail for work. 2. It helps employees get things done while collaborating more quickly and efficiently. 3. In addition to accessing Google Apps mail from the Gmail web interface, you can send and receive mail from your favorite desktop client. Depending on the client, you can use either the IMAP or POP mail protocol. 4. If you’re switching to Google Apps from Microsoft Exchange or some other Outlook service, you can use Google Apps Sync. This is a plug-in for Outlook 2003, 2007, 2010 or 2013 that lets you use Outlook to manage your Google Apps mail, calendar and contacts—along with your Outlook notes, tasks and journal entries. 5. 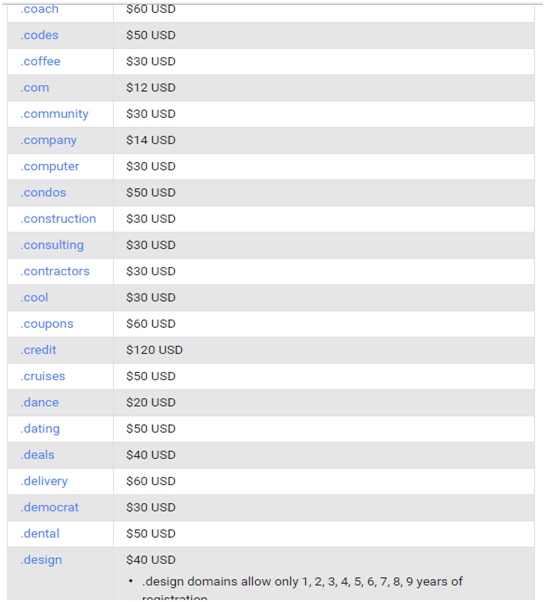 You can also purchase domains with Google Apps. Once the domain is purchased, they automatically set up Gmail for your domain and give you full control over your domain's settings. They don't host websites, but they partnered with companies who offer hosting and other site services that easily integrate with Google Apps. One of my friends, Ijas Ahmad tried to contact Google Apps referral program support team and he got a shocking reply. The members of the Referral Program who applied for The kit, they'll receive a branded notebook, pen and 10 unique coupon code personalized with your name and unique referral link for you to use during your in-person conversations with your network. We encourage you to have the kit handy every time you meet with your customers. Here is the screenshot of this message. Honestly, I'm not sure about this email. But I can just say, It's Google so it may possible. So, why to wait? Sign Up now. Links for Sign Up and Join Now are not affiliated links. 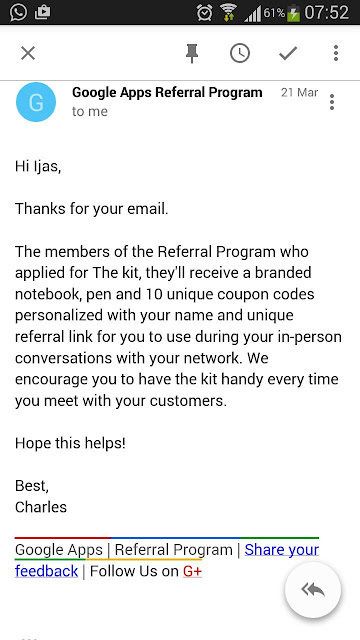 Google Apps Referral program pays for selling their product not for referring other people. This post is just for informational purpose. Message: I hope that you have enjoyed 'Google Apps Referral Program - Earn $7.5 Per User [How to Apply]' article. However, if you want me to deliver more items, then please share my post. You can use Social Sharing Widget provided at the end of every post. After all, Sharing is Caring! As of November 2015, StatCounter estimates that Google Chrome has a 58% worldwide usage share of web browsers as a desktop browser. It is also the most popular browser for smartphones, and combined across all platforms at about 45%. Its success has led to Google expanding the 'Chrome' brand name on various other products such as the Chromecast. Google releases the majority of Chrome's source code as an open-source project Chromium. A notable component that is not open source is their version of the built-in Adobe Flash Player, called Pepper Flash Player. Chrome is designed to be fast in every possible way. It's quick to start up from your desktop, loads web pages in a moment and runs complex web applications lightning fast. Chrome's browser window is streamlined, clean and simple. For example, you can search and navigate from the same box and arrange tabs however you wish - quickly and easily. When you don't want your website visits or downloads to be recorded in your browsing and download histories, you can browse in Incognito mode. In addition, any cookies created while in incognito mode are deleted after you close all open incognito windows. There are tons of ways to customise Chrome and make it yours. It's easy to tweak your settings and add apps, extensions and themes from the Chrome Web Store. 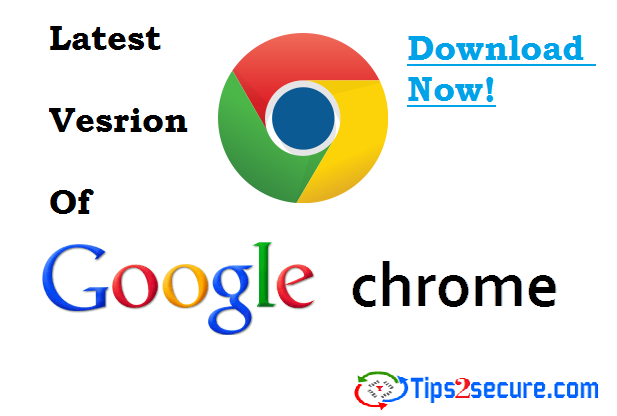 Here, I am mentioning two links to Install latest version of Google chrome browser. 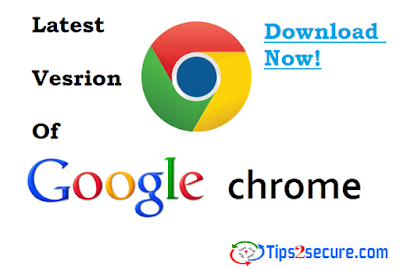 Google chrome is the best browser to surf the internet with more privacy and safety. Always try to use latest version of browsers to surf the internet with more enjoy. Message: I hope that you have enjoyed 'Download Latest Version of Google Chrome with Additional Features' article. However, if you want me to deliver more items, then please share my post. You can use Social Sharing Widget provided at the end of every post. After all, Sharing is Caring! OMG! 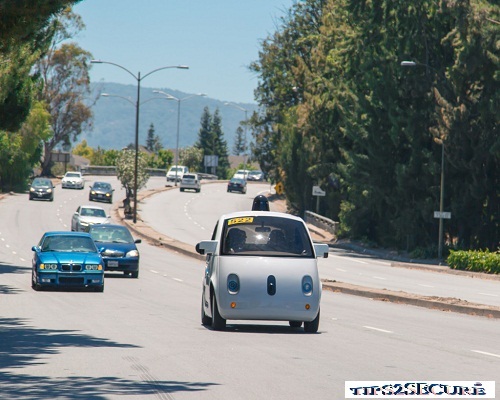 Google is going to launch a car which will run without driver. We can say it will be a driverless car. Actually Self-driving car also known as SDC is a project by Google that involves developing technology for autonomous cars. Google Chauffeur is the software powering this car. 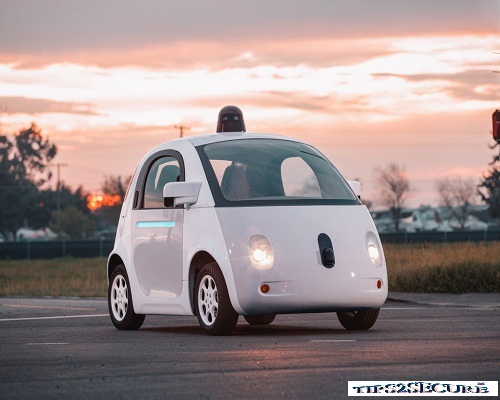 In this post am going to write all about this amazing car which is going to be launched by Google. I will also add images of that car in this post. The project team of Self driving car has equipped a number of different types of cars with the self-driving equipment, including the Toyota Prius, Audi TT, and Lexus RX450h. 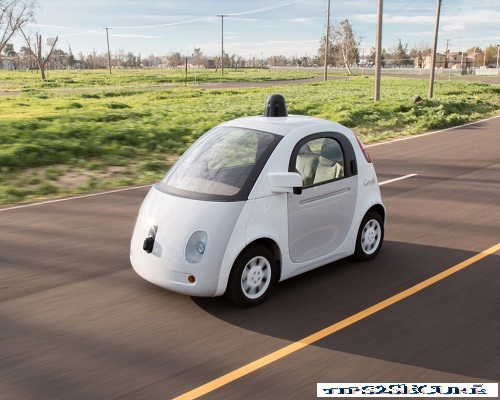 Google's robotic cars have about $150,000 in equipment including a $70,000 LIDAR system. Lidar is a remote sensing technology that measures distance by illuminating a target with a laser and analyzing the reflected light. Also, this car will not available for sale in public at start, but people will get chance to drive by google. This project is running from 6 years and in August 2012, the team announced that they have completed over 300,000 autonomous-driving miles without accidents. As of July 2015, Google's 23 self-driving cars have been involved in 14 minor traffic accidents on public roads, but Google maintains that in all cases the vehicle itself was not at fault because the cars were either being manually driven or the driver of another vehicle was at fault. Also in June 2015 Sergey Brin (Founder of Google) confirmed that there had been 12 accidents as of that date, eight of which involved being rear-ended at a stop sign or traffic light, two in which the vehicle was side-swiped by another driver, one of which involved another driver rolling through a stop sign, and one where a Google employee was manually driving the car. The great challenge of making a car without a steering wheel a human can grab is that the car must be able to handle every situation it encounters. Also as of August 28, 2014 the latest prototype has not been tested in heavy rain or snow due to safety concern because the cars rely primarily on pre-programmed route data, they do not obey temporary traffic lights and im some situations reverted to slower. But google has said that these issues will be fixed by 2020. Message: I hope that you have enjoyed 'Google Self Driving Car - Drive Car without Driver [SDC with Images]' article. However, if you want me to deliver more articles then please share my post. You can use Social Sharing Widget provided at the end of every post. After all, Sharing is Caring!. 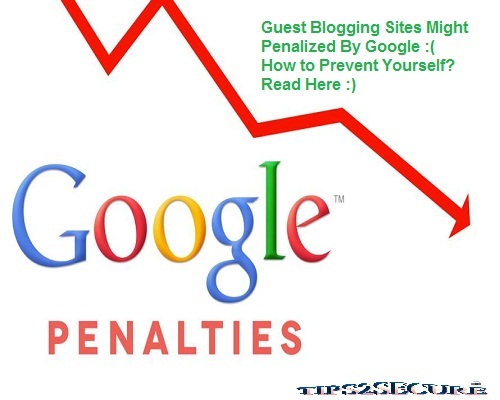 Google Might Penalize Guest Post Accepting Blogs In Future - Detailed Study on Why! These days a question becomes very popular in bloggers and site owners about Does Google penalize the blogs which are accepting guest post from guest bloggers? People who are giving their answer in 'YES' have stopped accepting guest post on their blogs. Some are still confused. I'm also receiving daily emails and messages asking about to guide and make clear about this question. After seeing this type of fearful environment in bloggers, I start doing some research on this Topic. I go though many assumptions from different experts. Some are saying It may happen and some are saying these are just assumptions by people because they all are afraid by Google panda and Penguin update. I talked some experts and also share this assumption on different forums to get response and views from them. I received many comments and views. After couple of weeks, I was succeeded in getting the real facts and answer with the help of experts and from SEO management team of Google. Will Google Penalize sites accepting guest posts - YES or NO? Accepting guest posts will never harm your blog or make penalize by Google. But if you are providing unnecessary backlinks for writer's blog then it will harm and also your blog may penalize by google in future. Here am not asking to stop giving backlinks to other sites, just give backlinks only the sites which deserve it. 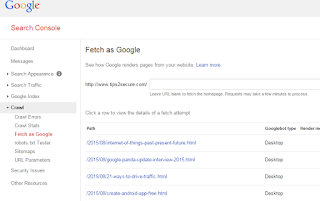 Why will Google penalize for Spammy guest blogging in future? Because accepting guest post and providing unnecessary backlinks to other sites providing a free way for guest bloggers to get trusted editorial links on popular websites. Which type sites might be penalized by google in future? Above given points are the signs for sites, which will make sites to be penalized by google in future. What to do to prevent yourself from being penalized by Google? If you are accepting guest posts on your site then give dofollow links to site only if they deserve otherwise give dofollow links only. Because after panda and penguin update google is realizing the spam which is being done by bloggers to rank blog fast in google. Bloggers are simply posting lot of guest posts to earn backlinks and just because of backlinks algorithms have to give more exposure to sites which do not deserve. This spam is mostly done by new bloggers. So to stop this spam google may have only a way to penalize the sites who are providing unnecessary backlinks. This thing is already announced by Google team in public which you already seen in above video. Don't try to do spam while accepting guest post. Overall writing and accepting guest posts will never harm your blog. Just do this by above-given rules and points. Even am also accepting guest post on Tips2secue but won't selling backlinks or providing unnecessary backlinks. 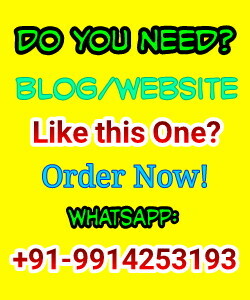 I make clear guest blogger before accepting their post that I will give dofollow link only if their blog or site deserve. If you are also a blogger and have a new blog then you should do efforts and give some time to grow your blog. Read my personal experience how I rank my blog in google without backlinks, It will guide you the right way. Message: I hope that you have enjoyed 'Google Might Penalize Guest Post Accepting Blogs In Future - Detailed Study on Why!' article. However, if you want me to deliver more articles then please share my post. You can use Social Sharing Widget provided at the end of every post. After all, Sharing is Caring!. Every webmaster and blog owner must know about the Google Panda Updates. Google done first Panda Update in February 2011. When I searched for these updates, I found lots of articles based on google panda update. And after reading that articles mostly bloggers start getting afraid from these updates. Our regular readers might know about us that we always make things easier and more clear for our readers and visitors. So today, I am going to reveal the real facts of Google panda updates, and what is Google panda update in real? How it may affect your blog? I have also mention the Interview with Google by Searchengineland.com in this post. Google panda update is a search filter by Google to stop sites with poor quality content to be appearing in search engine results. Panda is updated from time to time. Is it a matter of fear or not? No, if you are not using any illegal ethics for SEO of your blog. But Yes if you are doing spam to rank your blog higher in search engine results. 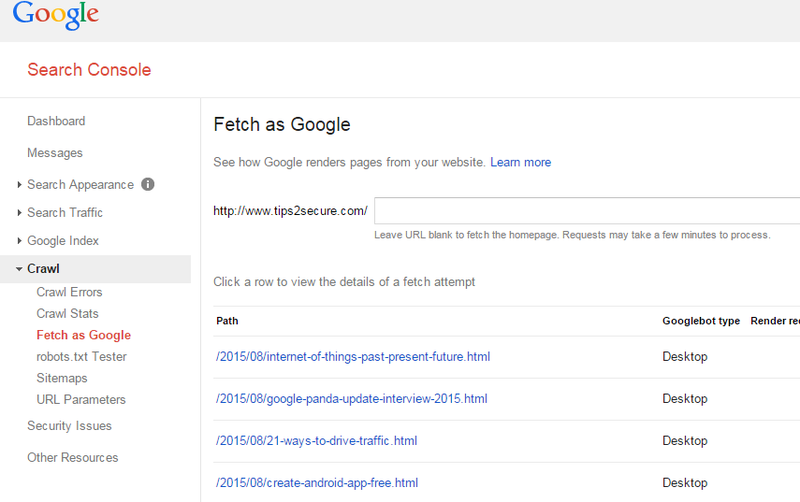 How to check your blog is affected by Panda update or not? Start checking and comparing your past analytics with current ones. If you feel there is a high fall in organic search then your blog may be affected by these updates. What to do to remove effects of Panda updates? Simply you should use legal ethics to rank higher again your blog. It may take long time to remove negative effects came due to panda update. You may have to wait until next panda update or sometimes it may done fast by Google. You should follow the Guidelines given by Google in 2011 to escape yourself from these updates. 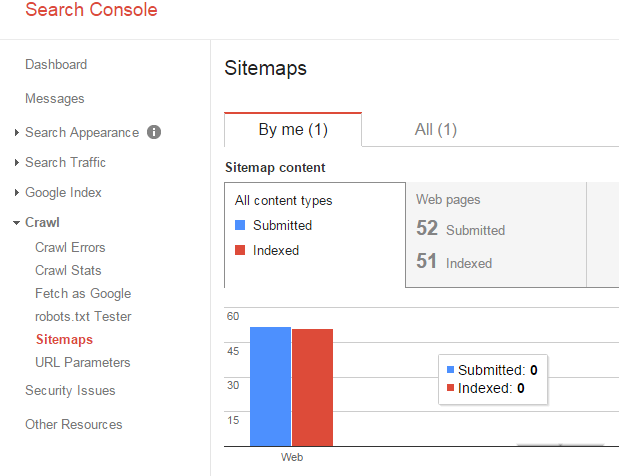 Google said there are technical reasons for this, but it is not done with the purpose of confusing SEO's or webmasters. So Some Of My Pages Might Drop, Not Others? Yes, pages that have been hit by Panda may show an impact at different times during the rollout. But I Thought Panda Was Site-Wide? 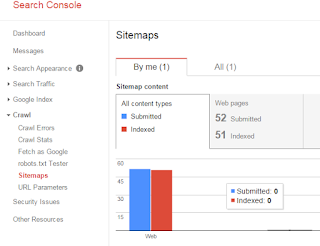 Google said that while Panda is a site-wide action, it might not affect all pages within a site the same way. Some pages might suffer more than others. How Will I Know If I have Escaped Panda? If you’re hit by the current Panda 4.2 update, you’ll probably have to wait several months until the entire rollout is done. Important: Google is also working on Humming bird Algorithm, which will again give more focus on useful quality content and a little bit on quality backlinks. Overall, You should not worry more about this update. And start making improvements in your blogging. If you still have any question or doubt even after reading this post, you can ask me frankly i will definitely give answers to your questions. Message: I hope that you have enjoyed 'Google Panda 4.2 Update - Interview Highlights With Google 2015 [Faqs and Answers]' article. However, if you want me to deliver more articles then please share my post. You can use Social Sharing Widget provided at the end of every post. After all, Sharing is Caring!. Here in these days we are listening that some gmail accounts has been hacked by hackers. This is done by super hackers, we can't do anything if our account is hacked once by hacker. But we can fully secure our accounts with security. Google has a facility to secure your accounts and is named as "2 Step Verification method"
In this post we are going to tell you about how we can switch on this function. To start this security follow following steps one by one. 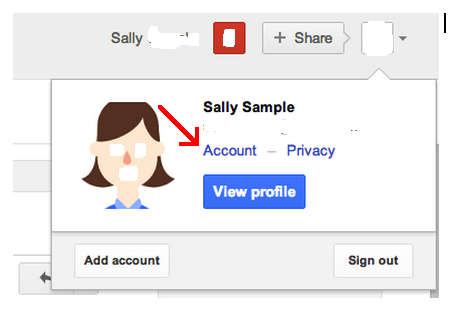 #1 Sign in to your google account. #2 Click on "Account" to update your settings. #3 On left menu bar click "Security"
#4 Here you will see "2step verification" with either disable or on. #5 If its off then click on edit or "Setup" to turn it on. #6 In next step it will ask you to chose your preferred method to inform you when somebody tries to login your account. #7 It will give you a call at the time of login if you chose calling otherwise it will confirm you through message. #8 After receiving call or sms you have to fill that code in the login page to login and access your account. That's All now your account is 101% safe and secure.